Raghu comes to Dhanak and says to Mai that Dhanak dont need jewelry, her light is in her simplicity, she doesnt need all this. Aslam takes people from for food. Raghu makes Dhanak sit in room and takes off her jewelry, he says you have simplicity and strength, I dont care if you wear my jewelry or not. He takes off all jewelry and says now you look like my Dhanak. They look at each other. Sejal’s inlaws are eating. Mom finds fish in food. She screams. Raghu and Dhanak comes there and finds fish in food. Mom says we are vegan. Father says to Mahindra that how could you do this? Mom says you made food. Mai says this is so bad, you people should consider about this situation. Mom says your son and friend made this food, we treated him well but is mind is poisonous. Mai says dont say a word about my son, my son didnt do anything, she slaps Aslam and says you knew they are vegan and you brought fish? say sorry. Aslam says sorry and leaves. Mai says forgive him. Mom says its okay. Raghu shows different bottles to Mai and says these are rooms for you and Dhanak. Mai says you have 12 hours to break Sejal’s marriage. Raghu says dont worry. Dhanak comes there and says you are playing game with me? you people are goons, you did that drama and now enjoying here, if you do something tomorrow then I will not spare you both. Raghu holds her hand. Dhanak says you have no right. Raghu says we have a relation, he shows her his name on her hand. Dhanak starts cutting her hand. Raghu stops her. Dhanak leaves. Mai says remember our deal. In morning, Dhanak welcomes guests and glares at Aslam and Batli. Parag comes there and says papa is calling you. Dhanak says its important to stay here, you go. Sejal comes there dressed as bride. Dhanak says you look so beautiful, I pray that you get my happiness too. Sejal hugs her and cries. Preeti wipes her tears. Mahindra asks where is groom? Mom says Vikram had some work from office, he is coming soon. Maya says to Mai that marriage is happening, he wont do anything. Mai says he will do something to get Dhanak. Mahindra asks father to call Vikram, he calls but phone is switched off. Dhanak says I am coming. She comes to Aslam and asks where is Raghu? he says I dont know. She comes in Mai’s house and asks where is Raghu? Mai says you are missing him? Dhanak says I know he did something, if something happens in my sister’s wedding then.. Mai says dont threaten me, I cant destroy all this setup in a blink, I dont know where Raghu is. Dhanak comes in mandap. Sejal shouts seeing Vikram coming there all blood stained. Raghu comes there with sword. All are stunned. PRECAP- Raghu shouts that I wont let this marriage happen. Mai says I told you to break this marriage if you love Dhanak and you did it. Dhanak runs to Sejal’s room and sees her hanging from fan. All run to her. 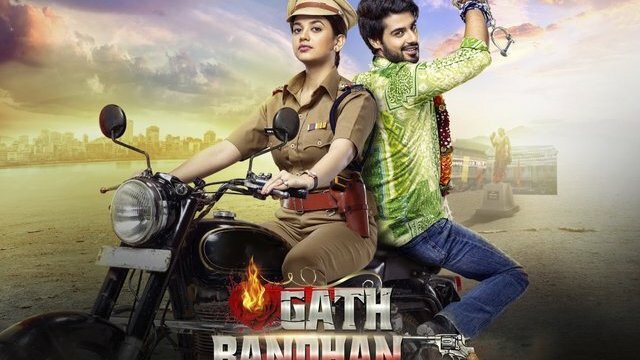 The post Gathbandhan 1st March 2019 Written Episode Update: Dhanak threatens Raghu appeared first on Telly Updates.